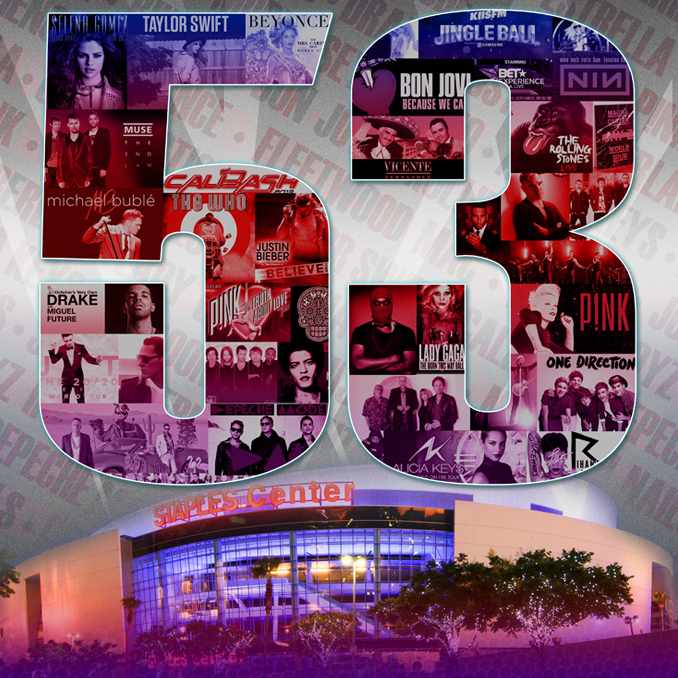 Los Angeles, Calif. (December 16, 2013) - STAPLES Center reached a major milestone in 2013 by hosting a total of 53 concerts, breaking the previous record of 38 concerts set in 2011. This was the year of multiple shows by the same artist at STAPLES Center that helped lead to the recording setting success that included four One Direction concerts, four Taylor Swift concerts, three Depeche Mode concerts, three Beyoncé concerts, three P!NK concerts, two Lady Gaga concerts, three Muse concerts, two Rolling Stones concerts, two Justin Bieber concerts and two Bruno Mars concerts, all which were sold out. "We are incredibly grateful to all of the artists, agents, managers and promoters who chose to make STAPLES Center as the place for their artist and tours to play in 2013," Lee Zeidman, STAPLES Center, Sr. Vice President and General Manger. "Southern California is filled with thousands of live music fans that are willing to buy tickets and come downtown to STAPLES Center and L.A. LIVE and make a night out of it to see their favorite artists." In addition to the remarkable records set by the 53 concerts, this week STAPLES Center was also named Instagram's 6th Most-Instagrammed Place in the World for 2013. The top spot went to Siam Paragon (shopping mall in Bangkok, Thailand), other notable Southern California locations included Disneyland ranked 3rd and Dodger Stadium ranked 8th. For the full list released by Instagram visit: blog.instagram.com/post/69877035043/top-locations-2013.